Health Crisis in Venezuela Hits The Rest of Latin America Hard : Goats and Soda Refugees are fleeing to try to get health care. And disease outbreaks across Latin America are being linked back to Venezuela. 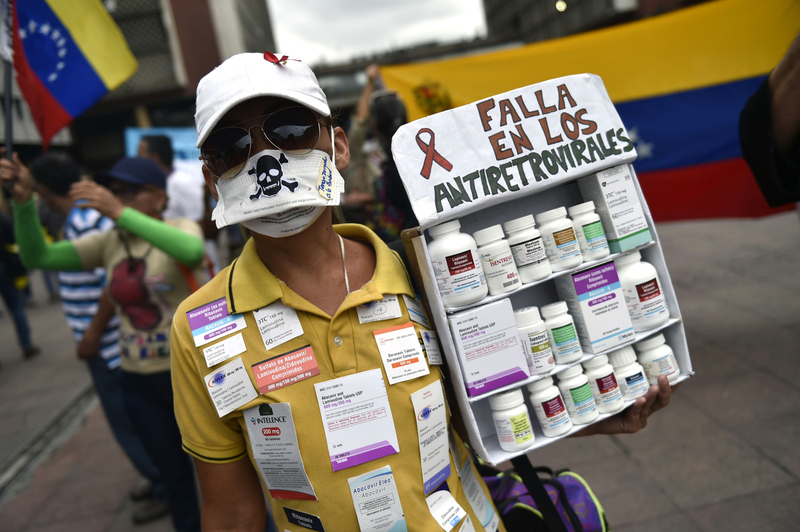 HIV-positive patients and their families protest hospitals' lack of medicines and supplies in Caracas, Venezuela, in April 2018. Some patients are fleeing to neighboring countries like Peru in search of lifesaving anti-retroviral drugs. Linkins says that among those 6,500 confirmed measles cases in Venezuela, at least 76 people have died. And after starting in Venezuela, this outbreak is now spreading throughout Latin America. "We've got over 10,000 cases in Brazil and 12 deaths. And it's also been now seen in Colombia and Ecuador, in Argentina and Chile and Peru," he says. Venezuela used to have one of the best health systems on the continent. Now it has the most problematic. The ongoing political and economic crisis has caused major shortages of food and medicine, hyperinflation and millions of refugees flowing out of the country. Venezuela now has two men who both claim to be the legitimate president. The country's downward spiral began in the waning years of Hugo Chávez's presidency in the mid-2000s. Despite having the largest oil reserves in the world, Venezuela's national vaccination campaigns for most diseases started falling apart in 2007. Measles is highly contagious, and Linkins at the CDC says that to stop outbreaks, health officials need to keep 95 percent of the population immunized. Each year that children weren't vaccinated in Venezuela, the pool of people whom measles could potentially infect grew. And the country became fertile ground for the virus. "It was not a surprise to many of us that Venezuela was going to have an outbreak," Linkins says. "It was inevitable that a [measles] case would be introduced because there's measles all over the world." In addition to measles, malaria has exploded in Venezuela and fueled outbreaks in other parts of the region. Alfonso Rodríguez-Morales is a professor of infectious diseases at the Universidad Tecnológica de Pereira in Colombia. He grew up in Venezuela and went to medical school in Venezuela before emigrating to Colombia eight years ago. "Venezuela right now is the biggest problem in the region in terms of malaria," Rodríguez-Morales says. "Malaria is significantly increasing year after year." When he was a kid, Rodríguez-Morales says there were very good mosquito control programs in his country. Venezuela officially eradicated malaria in 1961, but he says the disease slowly crept back in. Then over the past couple of years it has exploded. "Last year, 2018, closed with over half a million cases of malaria," he says. "This has been never recorded before in the country." Those hundreds of thousands of people who got malaria in Venezuela last year and anyone who gets it now are unlikely to get treatment. "The national malaria program right now is not working well. There is no appropriate diagnosis there. Also, there are no drugs for treatment," he says. "We have right now the perfect scenario for a continuation of the malaria epidemic in the country." UNHCR, the U.N.'s refugee agency, says more than 3 million Venezuelans have now left the country because of the ongoing crisis. Most have ended up in Colombia, Brazil and other parts of South America. And when they get there, some are carrying malaria or other diseases with them. In just the first eight months of 2018, officials in Peru say that 550,000 Venezuelans arrived in their country. The Peruvian Ministry of Health says 720 of them were immediately absorbed into the public HIV treatment program. This put a huge strain on Peru's HIV drug delivery system, particularly in the capital, Lima. Patients say Venezuela's public health care system ran out of the lifesaving anti-AIDS drugs months ago. But it's not just people in need of health care who are fleeing Venezuela. The country is also losing health care professionals. In December, when Chile gave its national exam to certify doctors to work in its public health system, just over 5,000 applicants sat down to take the test. Almost half of them, 2,300, were physicians from Venezuela.